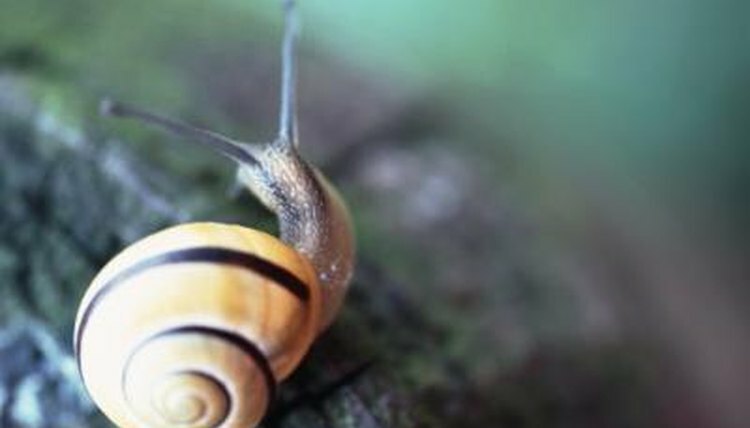 Slow-moving and gentle, snails may make a fun pet for children and aquarium lovers. Snails fall into three main categories: land, freshwater and saltwater, or marine. While there is overlap among their food requirements, different types of snails need different habitats and diets. Land snails enjoy plants, fungi and algae. They naturally congregate in fields and grassy areas. Provide a land snail with plant matter and vegetables such as lettuce, dandelion greens, cucumbers and carrots. Experiment with different types of greens to see what your snails enjoy eating. To feed snails, place the plant matter in the tank and leave it there for several days. If the food begins to rot or mold, discard it. Snails subsist largely on algae and decomposing plants, but some species also eat dead fish. While this makes them great aquarium cleaners, they can also multiply and take over an aquarium if not kept in check. If you keep fresh plants in your aquarium, your snails can eat dying plant matter and naturally occurring tank algae. Snails do eat fresh plants but prefer the dead plant matter to live plants. Sea or marine snails live in saltwater. Like their freshwater cousins, they may eat plant matter, namely algae, or animal matter, namely fish or other types of invertebrates. Snails in the Murex family are carnivorous. Some snails are scavengers and will help themselves to whatever food they can find. If keeping carnivorous snails, stock the aquarium with prey such as small bivalves. If you prefer plant-eating sea snails like the cowrie, include saltwater plants in the aquarium and leave tank algae for snails to eat. In the absence of predators, well-fed snails will mate and multiply. Keep the population of fresh or saltwater aquarium snails in check by stocking fish that eat snails. Keep the population of a terrarium in check by giving snails to friends or releasing some back into the wild.